Call Trucks Only Internet Department 602-354-7623 for all the specs and to schedule your test drive! Your buying risks are reduced thanks to a CARFAX BuyBack Guarantee. 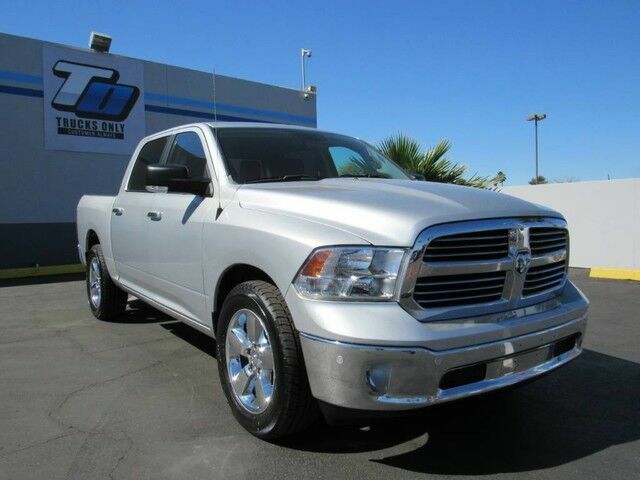 This Ram 1500 Big Horn has a showroom quality finish with no dents or scratches visible. More information about the 2017 Ram 1500: The Ram 1500 already offered truck buyers a whole host of reasons to consider it, with powerful Hemi V8 availability, coil-over rear suspension and innovative storage solutions. With some very effective upgrades in key areas -- namely increased chassis strength, improved base engine power as well as diesel efficiency and more intuitive interior ergonomics. The Ram raises the bar for full-size trucks. This model sets itself apart with Ram-Box bed-side storage, increased fuel efficiency, Multiple model configurations to suit all needs, ample available V8 power with improved V6 and EcoDiesel V6, and user-friendly cabins First Oil Change on us, with every vehicle purchase. Ask if this vehicle qualifies for our Lifetime Engine Warranty! *Diesel and high performance engines are not applicable. Trucks Only has been in business for over 40 years. Our customers have helped us to earn and maintain the A+ rating with the Better Business Bureau and we have been honored to achieve the Customer Satisfaction Award with DealerRater 3 years in a row! Call Trucks Only Internet Department 602-354-7623 for all the specs and to schedule your test drive! Shipping is available across the United States! Please let us know how we can help you find the right solution for your needs!